Neil Young's rusty, heartbreaking voice is one of the most distinctive in rock 'n' roll, and his career, always fascinating and never predictable, continues to brim with vitality after 40 plus years of music-making. He began his career in the mid-'60s as a solo act in his birthplace of Toronto, Canada, where he had played in a couple of bands, including the Esquires and the Mynah Birds. Moving to Los Angeles with friend and Mynah Birds bandmate Bruce Palmer, Young and Palmer formed Buffalo Springfield there with Stephen Stills, scoring a few hits before Neil Young finally quit in May 1968 to pursue a solo career, releasing his self-titled debut in 1969. His future backing band, Crazy Horse, came together around this time, playing on Everybody Knows This Is Nowhere, his widely acclaimed 1969 LP. That same year, he began playing as part of what would be a long-running collaboration in Crosby, Stills, Nash & Young, appearing on the following year's Déjá Vu. 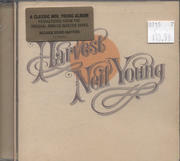 Young's next two solo albums, 1970's After the Gold Rush and especially 1972's Harvest, would boost his profile considerably, bringing about a Number One hit with Harvest's "Heart of Gold." He documented the tumultuous tour with the Stray Gators, his studio backing band, with the film Journey Through the Past and the live album Time Fades Away, neither of which were well-received at the time. This marked the beginning of a dark period in Young's sound, which continued with the cynical On the Beach (1974) and the drunken, harrowing catharsis of 1975's Tonight's the Night, recorded in the wake of the death of Danny Whitten and roadie Bruce Berry. From there, his aesthetic interests would shift and change fairly radically, beginning with the hard rock of Zuma in 1975 and its country-rock styled follow-ups, American Stars 'n Bars and Comes a Time. His "Rust Never Sleeps" arena tour in 1978 had him playing a half-solo, half-Crazy Horse set of new material, followed by the Rust Never Sleeps full-length the following year. His 1980s output saw more mixed reviews, but he made some daring, compelling statements in that time: from the synth-driven, experimental sounds of 1983's Trans to the major label condemnation of This Note's For You, his work generated as much buzz as his controversial support of Ronald Reagan. In the early 1990s, he experienced a resurgence in popularity alongside the emergence of grunge, and eventually he was inducted into the Rock and Roll Hall of Fame in 1995 by Eddie Vedder of Pearl Jam. Among his most noteworthy projects of the decade was his soundtrack for Jim Jarmusch's Dead Man and 1995's Mirror Ball, recorded with Pearl Jam. Since the turn of the millennium, Young has become more involved in filmmaking (most notably with 2003's Greendale film and concept album), and even more politically outspoken with the off-the-cuff protest record Living With War in 2006. Each year, he holds a benefit for the Bridge School, a Northern California school for mentally and physically challenged students he helped start back in 1986. 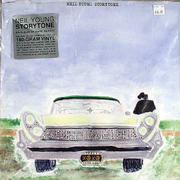 In 2002, writer Jimmy McDonough published Shakey: Neil Young's Biography, which gave what is still the best available account of Young's storied career, from his earliest days in Canada to his life on America's west coast. His most recent record is 2009's Fork in the Road, the theme of which is his emission-free LincVolt automobile.